The moon is our almost constant frenemy in space, lighting our nights and spoiling our star-views in equal turns. But now, new measurements from Apollo-era moon rocks suggest that the moon and Earth had a much more savage past than we knew. The old theory of the moon’s origin—in which it formed from debris from a grazing collision—neatly explains both the moon’s size and orbital position. But a test on some lunar rocks from the Apollo mission revealed something odd which that theory couldn’t explain. If the four-decade old theory were correct, then researchers would expect to find that well over half of the moon’s material had come from that Mars-sized body that scraped Earth to form the moon. But the researchers weren’t finding signs of that in the samples; instead, chemical analyses on the samples were returning isotopic compound readings that were nearly identical. They started to do more and more advanced tests to try and pinpoint any differences in the signatures. They finally found one—but one that suggested that the samples’ origins were even more tightly connected than previously expected. The isotope signatures were the same, except for more of a heavy-potassium isotope in the lunar samples which would have required incredibly hot temperatures to separate out. 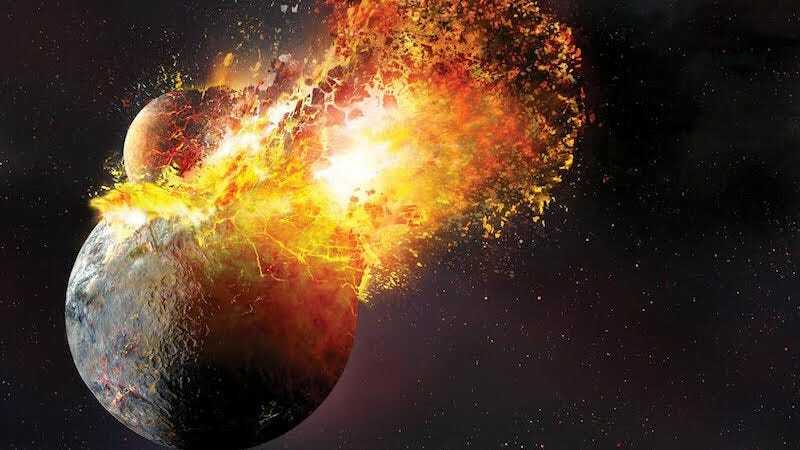 A violent collision between the Earth and the Mars-sized impactor could have caused those incredibly high temperatures. In this model, the temperatures were so high and the force so powerful that the impactor and even much of Earth vaporized on contact. That vapor then expanded out over an area 500 times the size of the Earth before finally cooling and condensing into the moon. This new data doesn’t just change our conception of how the moon was formed, though. It also suggests an early solar system that was much more volatile than we knew—and it could be just the beginning of what new analyses on old lunar samples could teach us. The researchers will continue to study the Apollo lunar samples to try and pull yet more clues from them. Even now, they suspect that these samples that we’ve been holding on to for decades could have more secrets to reveal.